It can be argued that markets, more than any other institution, have been, collectively, the hub that holds together the wheel of urbanized society; this is now a given for most urban historians, and  notwithstanding the preoccupation of classic writers with constitutional characteristics of boroughs  is not new-fangled [see for example Thomas Kerslake, "What Is a Town? ", Archaeological Journal, vol.34, (1877), pp.199-205]. Like towns, markets are places where people congregate and interact in order to respond to each other's needs in ways that are, on the whole, mutually beneficial. Despite the permeation of shop-based retail commerce in the post-medieval centuries, and the rapid  one might almost say revolutionary  growth in the modern world of online commerce around the turn of the millennium, marketplaces are still the focal point of many smaller towns today, and market attendance still part of the weekly routine of town-dwellers. While the very gradual revival of commerce, following the collapse of the western Roman Empire and the influx of waves of outsider groups to fill the power vacuum, was at one time explained largely in terms of merchants braving the dangers of long-distance voyages, historians are now more cognizant that a growing volume of small, local or regional transactions was at least equally important in the formation and densification of a network of markets, which in turn stimulated production and facilitated product aggregation in ways that made large-scale, long-distance commerce viable. Although many market transactions were, and are, occasional, casual and singular, markets tend to foster the formation of more enduring interpersonal networks of producer-consumer and trader-trader types; such interpersonal networks stabilize and fortify the institutional networks, the two together forming a backbone for commercial growth. Economic historians have similarly differentiated between consumer and trader models of periodic marketing [Tim Unwin, "Rural marketing in medieval Nottinghamshire," Journal of Historical Geography, vol.7 (1981), p.232-33]. The process of re-emergence of the institutional infrastructure supporting trade has, however, been less studied by historians than the growth of that trade itself. Here our concern is with the development of the urban-based component of the market network in England; interpersonal networks, which did much to give rise to a merchant class, are very difficult to perceive during those centuries in which the market network took shape, although they start to become more visible in the Late Middle Ages, once we have routine recording of debt recognizances and lawsuits, export licences, and customs accounts. Yet trade became a regular activity primarily where people congregated  whether for reasons of mutual support and protection, court sessions, worship, or social interaction  and settled, so that the revival of town life is closely tied to the redevelopment of a market network, albeit that towns were not solely responsible. Historians today are more likely to speak, in regard to the Early Middle Ages, in terms of 'central places'. These might include locations of minsters  that is, churches erected, in the era before medieval parishes were formed, on large private (particularly royal) territories, often contained within some kind of enclosure, and endowed to support, financially, a community of secular clergy intended, initially, to help Christianize the local population by converting, baptising, and adminstering the sacraments (the term surviving today as an honorific for the more important churches)  and of centres for administration for royal estates or for hundreds. These types of places remained important, in terms of both urbanization and expansion of the market network, following the Conquest, largely because of the engagement of some lords in the organization, or authorization of the same, of commercial activity. Central places tended to be foci for population, the regular, if infrequent, meetings of hundred and shire courts drawing together a broad range of consumers and agricultural producers, while minsters (a phenomenon that is still somewhat hypothetical, with many minster identifications tentative), if they functioned also as pilgrimage destinations or informal markets, could also attract a transient element. However, the existence of a royal estate with minster was no assurance a place would develop as a market settlement. A case in point is Tisbury, in Wiltshire, where no market is evidenced, although this may have had something to do with the minster community having disbanded after the Tisbury estate was granted to Shaftesbury Abbey before the mid-tenth century. Nor can we restrict ourselves to royal estates and minsters to explain the growth of a market network in Wiltshire, or elsewhere. Corsley  whose parish of that name contains not even a village, settlement at Corsley being no more than a hamlet whose Domesday population was very small  provides an example of a minor estate, granted by Henry II out of the royal estate of Warminster; in 1232 the manor was acquired from descendants of the original grantee by a relatively minor landowner who licensed a market and fair the same year, and probably built the local church, first heard of in 1245, as a chapel-of-ease which was allowed some parochial functions because Warminster's parish church was so far off. Although nothing more is heard of these commercial institutions  perhaps because the owner gave the manor to the nuns of Studley in 1245 to finance a chantry  taxation records of the fourteenth century indicate that Corsley's population and prosperity had nonetheless increased. The growth of trade in England is often described in terms of the growth of boroughs, particularly those that were regional centres or ports. Most large and ancient towns of England were once small, new towns and, moreover, market towns; consequently English urban history cannot be fully understood by focusing attention solely on the larger, better-known towns. What has become a widely accepted tenet among economic historians has been stated by Rodney Hilton thus: "the development of small and medium sized market towns is a good indication of the progressing commercialization and urbanization of a medieval economy" ["Medieval Market Towns and Simple Commodity Production", Past & Present, no.109 (Nov. 1985), p.5]. When medievalists talk about market towns they often are using the term to distinguish smaller towns from cathedral cities, county towns, or well-chartered boroughs whose origins and historical development are better understood  usually because more richly documented. However, these different categories are not hard and fast, but overlap. For one thing, not a few small towns were at some time referred to as boroughs, or we hear of burgesses living there, and some even received charters of liberties typical of boroughs, though these did not always go much beyond advantageous tenurial conditions provided to only a subset of the total local population. Still today one encounters, within a few towns or villages (e.g. Montacute and Yeovil in Somerset), areas to which the name The Borough has been affixed  though at what date is uncertain  in the form of open spaces surrounded by residences, likely representing former marketplaces around which traders and/or craftspeople were settled through planned projects of possibly burghal character. Historians have used various criteria to identify or define boroughs, such as: being taxed at the higher rate applied to boroughs ('taxation boroughs'); being instructed, or having the right, to send representatives to parliament ('parliamentary boroughs'); receiving seigneurial grants of particular sets of privileges or liberties ('chartered boroughs'); or simply documentary references to burgesses or burgage properties there. Again, these sets of categories are overlapping. Similarly, the category of market towns did not exclude boroughs. When Edward I sought urban representation at his early parliaments, he ordered invitations to be sent both to boroughs and market towns, perhaps perceiving no significant distinction between them, for his purposes; his sheriffs had a more difficult job in implementing their orders, however, and it was not long before the distinction was abandoned. The term villa mercatoria is also found in other contexts, but rather than being understood as a category entirely differentiated from boroughs, it seems more to be cross-cutting, for some of these 'market towns' had burgess residents and might be described as borough in the same or some other document; nor is there any reason to suppose market towns were being distinguished from chartered boroughs. Chartered liberties were not prerequisites for towns to have borough status, for the entry level was defined by burgage tenure, this creating quite a bit of variability within the 'borough' category, which could include places from small market towns to large cities; some places accorded that status may have been towns from the legal perspective, yet in other senses do not, arguably, deserve to be so categorized. Several well-respected urban historians of the early twentieth century held that burgage tenure was the primary defining characteristic of a borough, as distinct from a township, though allowing that no generalization would hold true for all examples, and it remains considered today one of several indicators that assist historians to make the call, though not necessarily a sine qua non. Furthermore, as Alison Deveson observes, "it has been noted that burgage tenure could exist in rural communities" ["Medieval Whitchurch: The Origins of a New Town", Hampshire Studies, vol.53 (1998), p.125], yet the authority on which she draws  Pollock and Maitland's History of English Law  supports that conclusion with two examples (Atherstone, Warks., and Pilton, Devon) that are not entirely lacking other characteristics of urbanizing communities, and for which market licences would be obtained. While certainly the distinction between rural and urban communities can be hazy, it may well be that burgage tenements were normally introduced only in places where the manorial lord had ambitions to establish a market town, even if such ambitions did not come to fruition; this is true of the Hampshire Whitchurch that Deveson was herself studying [see also "Medieval Whitchurch: Failed New Town or Successful Village? ", Hampshire Studies, vol.55 (2000), pp.169-84]. The principal advantage of adding burgage tenements was in attracting  probably mainly from within the manor and its surrounds  new or upwardly mobile settlers of types, industrious and ambitious, that could be expected to contribute to developing the commercial potential of the manorial economy. Not a few supposed boroughs were so insubstantial, even by medieval standards, as to comprise just a cluster of burgages alongside a small marketplace and it is hard to imagine a society of a few dozen burgesses with the socio-economic sophistication that one would expect from an urban community. This is perhaps particularly noticeable in Devon  a shire with a thin and scattered population, a relatively undeveloped economy, and consequently the appearance of scope for competitive urban enterprise  for which Beresford & Finberg's urban survey (taking into account its later supplement [Urban History, vol.8 (1981), pp.59-65]) registered an extraordinary 75 towns having come into being before the close of the Middle Ages, most as seigneurial foundations of the thirteenth century; this was more than in any other county, and some were situated very close to each other, vying for a share of existing road-based or coastal trade, so that only a handful ever amounted to much. In some, perhaps many, of such cases across the country it might be more meaningful to think of them as burghal components, or units, within larger variegated communities, rather than mature towns. But, more important for our present purpose, markets are considered one of the key defining features of an urban settlement, so that even a relatively large settlement for which there is no evidence of a market or marketplace, is not likely to be credited with being more than proto-urban (that is, in the process of developing at least some of those characteristics by which we would define a town. The term 'market town' is thus practically tautological; though it is incorrect to assume, as some writers have done [e.g. A. Hollingsworth, The History of Stowmarket: The Ancient County Town of Suffolk, Ipswich, 1844, p.65; M. Taylor, "Kirkoswald Castle", Transactions of the Cumberland & Westmorland Antiquarian & Archaeological Society, 1st ser. vol. 2 (1876), p.1] that possession or the grant of a market converted a village into a town. It is difficult to imagine a town without a market, formal or informal, and the relationship between owns and markets could arguably be thought of as symbiotic. Ironically the nearest to an exception that proves the rule might be London, where the spirit and reality of commerce was so deeply embedded, that it took many forms and did not rely on a single central market  despite that the wide, open, and shop-lined street known as Cheapside served as a very market-like space  or even several dispersed ones, so that the city as a whole might be considered an emporium within which a number of foci for commerce developed over the course of the Middle Ages. Yet we might also point to the Essex settlements of Wivenhoe, whose importance and prosperity arose from its role as a port, and Bocking. The latter was a late Saxon settlement on a Roman road, originally focused around church and manor-house, which from the 990s was under the lordship of Canterbury cathedral-priory and developed a cloth-making industry  aided by the priory's construction of a fulling mill (1303), an influx of Flemish weavers the following year, and building of two more fulling mills before the close of the Middle Ages  so that by the late medieval period it had become an important and prosperous cloth centre, with almshouses, hospital, schoolhouse, possible guildhall, and several houses containing halls likely used to sell cloth and wool. Like Wivenhoe, within the shadow of the major market centre of Colchester, Bocking is not known to have had its own market  pillory and whipping-house, common features of marketplaces, being placed instead by the gate into the manor-house  perhaps because able to rely on that of neighbouring Braintree. Mention might also be made of Epsom (Surrey), where Domesday records a church-focused village, held by Chertsey Abbey; at later but uncertain date, the abbey created a new component west of the village, by digging a pond to drain an area of ground and provide a watering-hole for cattle; the reclaimed land surrounding the pond was then divided into some sixty long, narrow plots, backed by meadows  this would later become part of Epsom's High Street neighbourhood (consequent to its post-medieval role as a health spa resort). Cottages and farmhouses were built at the front of these plots. Yet the new settlement seems to have been predominantly agricultural in character, there being no evidence of a market during the Middle Ages. As an alternate for 'small town' the descriptor 'market town' remains useful to help divide up the large number of towns into different, if somewhat artificial, categories, and to remind us of the variability that existed within the medieval urban sector, just as exists in our own time. Tait [The Medieval English Borough, Manchester: University Press, 1936, p.356] suggested that villa mercatoria might be better translated as 'merchant town', to improve differentiation between places involved in long-distance trade and manorial vills possessed of markets and serving mainly local traders and consumers. But this distinction would be a difficult yardstick to apply when we know so little about the relative percentage of sales involving locals compared to outsider merchants at particular market locations; furthermore, it relies on a narrow understanding of the meaning of 'merchant'. Going in the opposite direction, economic historian Richard Britnell used 'market town' for "any settlement with a formal weekly market" ["Burghal characteristics of Market Towns in Medieval England", Durham University Journal, no.73 (1981), p.147]. This served his immediate purpose - to argue that tenements of a character normally characterized as burgages seem to feature in many rural settlements that are not otherwise considered boroughs  but since it includes innumerable manorial villages where licensed markets were established, it is not helpful from the perspective of the historian trying to chart the often nebulous process of re-urbanization during the Middle Ages. However, it is certainly the case that settlements incorporating compact clusters of plots that have the characteristics of burgages (land-poor tenements well suited to the needs of individuals making a living primarily through a trade, craft, or service, rather than agricultural labour), while they may reasonably engender an initial suspicion that the settlement was, or contained, a burghal component at some time in its history, are not by themselves sufficient evidence of that, for reorganization of tenures in manorial villages could sometimes produce the same appearance, as was recognized as far back as the compilation by Beresford and Finberg of English Medieval Boroughs: A handlist [Newton Abbot: David & Charles, 1973, p.35]. New neighbourhoods created by seigneurial lords to extend an existing settlement, for example, often seem to have adopted this kind of plot pattern. Disproportionately long plots  length at least six times width  seem to be more typical of earlier new town foundations than of later ones [D.M. Palliser, T.R. Slater, and E. Patricia Dennison, "The Topography of Towns 600-1300", in The Cambridge Urban History of Britain, vol.1 (2000), p.169]. A stronger, though still not absolute, presumption of the existence of a market town comes where burgage units and a market are both present in a settlement, especially where they are topographically associated (usually, adjacent), and so the Handlist [p.36] implicitly saw market towns as "the smallest settlements that had developed (or were being given) opportunities for economic activities beyond agriculture", although this too fails to weed out villages with markets. Historians seem to be moving increasingly towards perceiving market settlements as a continuum of types, rather than attempting a rigid distinction between village and town. 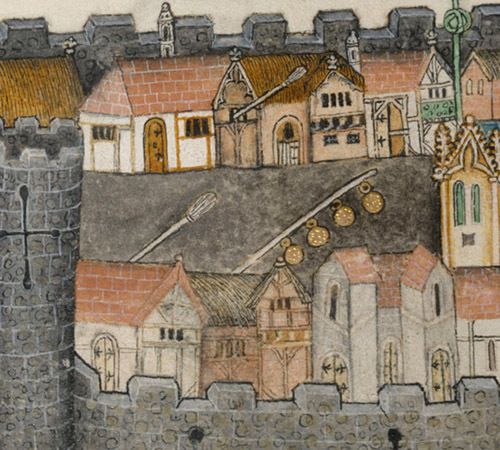 Extract from depiction of a town in the Luttrell Psalter (British Library Add. MS 59874) f.164v. In a central position within the circuit of protective walls, a wide public space  high street, or marketplace  is shown flanked by houses, shops, taverns (with the traditional sign of a fresh brew hung from their facades), and a church. Although the idealized depiction nominally repesents Constantinople, the artist was informed by a knowledge of English contexts, and his rendering of the marketplace would have rung true to Sir Geoffrey Luttrell, who commissioned the psalter and who, at his manors of Irnham (Lincs.) and Hooton Pagnell (Yorks. ), owned markets licensed by ancestors in 1252 and 1254 respectively, decades before the illuminated manuscript was made. Here it is not the intent to attempt a definition, but to examine a number of settlements for which the evidence, varying in different cases from conclusive to dubious, suggests the association of markets with urban contexts. The focus of this study on urban markets is partly for purposes of manageability. But it should not be assumed from this that towns were the predominant players in commerce; much trade took place, and many markets existed, within manors of a purely rural character, even though urban markets seem to have been more likely to weather the vicissitudes of the Late Middle Ages. Indeed, as many of our case-studies will evidence, manorial lords, intent on exploiting their lands and tenants more effectively, played a key role in fostering the development of the market network, which in its turn served as an invaluable infrastructure component of a commercializing economy, not least because the regulation of market activity, by enhancing the security and fairness of transactions, encouraged wider participation in commerce. This developmental process seems, if not haphazard, then uncoordinated and intended to further personal self-interest rather than national economic benefit; yet in some cases the impression given is that manorial lords  whether individuals or multi-generational families  had some kind of strategic economic plan in mind. Whereas commercial growth tended to express itself in Devon through the foundation of an exceptional number of small towns, the very low number of such foundations in East Anglia  even though this matter is still under-investigated  is equally remarkable and shows that urban status (or, rather, the trading advantages that tended to accompany that status) was not a prerequisite for commercialization, nor was it a guarantee of market durability. In the early period of re-urbanization, as Europe emerged from the so-called collapse of the Roman Empire, this variability was arguably less pronounced. In the case of England it is hardly valid to talk about small towns in the Early Middle Ages, for we have very little information about population sizes and no English towns could be considered large, by standards of the later Middle Ages. Indeed to talk of 're-urbanization' (or 'proto-towns') at all in regard to medieval England is to impose a hindsight interpretation on history, for urbanization hardly seems a conscious goal, let alone policy. Yet nor was it merely an accidental or incidental by-product of broader social, economic, and governmental trends. We must remember that the Normans were closer than the Anglo-Saxons to both the traditions and the physical and institutional legacies of a well-urbanized Roman civilization and its successors  the memory of Rome enduring as an aspiration of political leaders. Nor were the Saxons entirely divorced from that past, including in the age of burh-building; not all towns of Roman Britain had been entirely abandoned, so that their physical infrastructure (particularly their defensive enclosures) provided in a few cases a measure of continuity in terms of administration and perhaps limited settlement, though some urban communities may have regressed to a predominantly rural character. For the most part, however, Anglo-Saxon rulers preferred to establish their own bases, though they were happy enough to allow religious buildings to go up atop the foundations of Roman ones and they appreciated the communication and transportation benefits of Roman roads. Re-urbanization should be thought of as the natural result of a number of gradual processes. One of these was the re-establishment of regional authority structures, whose centres  some ecclesiastical, such as cathedrals and monasteries, some secular, such as royal vills (villae regiae)  attracted settlement, for they offered some protection from lawlessness, employment opportunities, and the benefits (associated with comfort and convenience) that most humans, as social animals, desire. Although it is not clear how many places were truly royal vills, or retained that role over an extended period, certainly there are some places, such as Wilton, that owe their urban status to their selection as royal residences and administrative centres. The presence of an important minster church tends to be a more reliable explanation, in a number of cases and perhaps particularly in the opening couple of centuries of the Middle Ages, for the growth of settlements that later became urban, whether gradually or through an act of town-founding. However, in the absence of detailed documentation or good archaeological data, there remains something of a chicken-and-egg conundrum in the relationship between markets and secular administrative bases. Part of the problem is that medieval society's reliance primarily on wood and other degradable materials for dwellings, implements, and utensils has deprived archaeologists of much evidence they might hope to find; this lack is particularly keenly felt for the Anglo-Saxon period, when documentation too is in relatively short supply. The revival of commercial activity  which can never have entirely died, just as Romano-British foci for population and administration continued, if in a reducing state, after the departure of the Roman legions  was another of these fundamental processes. It gravitated towards the 'central places' where authority at least held on (for authority figures were wealthy consumers of goods and services). But it is also evidenced (in part by discoveries of coins, as far back as the eighth-century sceattas) along coastlines, in hill-forts, at crossroads, or any places where people might gather for various purposes from time to time, and this informal trade might, in some and perhaps many cases, stimulate the growth of permanent settlement there. Due to the purpose and late date of much of surviving medieval records, historians tend to focus on a model of urban development in which existing nucleated settlements, usually served by their own church, through the introduction of formal markets and personnel to foster commerce and industry, become urban or proto-urban in character. Yet we cannot ignore another possible model, in which trading places grew up first, at key points along important ancient routes through areas of dispersed rather than nucleated settlement, and with a church added only later; because such trading places would have developed in the pre-Conquest period, reliance is placed mainly on topographical evidence to argue for this model. By the time the Normans began to impose their own cultural perspectives on freshly-conquered territories across England, the advantages stemming from commerce were well appreciated, and fostering commercial activity that was not tied exclusively, or even primarily, to towns was a component in Norman strategy to develop those territories for personal profit. Though the provision of markets  as evidenced by licences or marketplaces  and attraction of new settlers to provide goods for the market, whether through the cultivation of land or manufacture of consumables, appears to have become a fairly standard feature of new town foundations, commerce could, by its nature, never be a purely urban phenomenon, despite initiatives by higher authorities to encourage it focusing on urban settlements; so neither could markets. Having, in most cases, little jurisdiction or formal coercive power extraterritorially  although organized incidents of group aggression might sometimes be applied to intimidate rivals or enforce claimed monopolies  English towns could not suppress or control rural trade. They could only exploit their advantageous locations within the communications network, foster conditions favouring trade (such as better facilities, regulatory oversight, a wider range of commodities, and a larger and wider group of buyers and sellers), and provide residents with the benefit of freer access to trade, all with the hope of acquiring a pre-eminent role in the commerce taking place in their regions. Traders and craftspeople were a significant component, albeit initially a minority, of the residents who clustered at places where commerce occurred with some regularity, where conditions (both topographical and seigneurial) allowed trade to be carried out with greater security, and where communication routes penetrating the hinterland  those parts of the surrounding countryside of a market town whose rural inhabitants had the most regular and most significant interaction, economically and socially, with the townspeople  and leading to more important settlements (notably large boroughs or cities), provided best access to raw materials and to collectives of consumers. It was partly the issue of access that must have rendered unappealing, as sites for urban development, pre-Roman hill-forts, except in cases where such sites had already become homes to ecclesiastical centres or were converted to burhs, and even the latter might not develop beyond a defensive use. The burhs are, of course, only one strand in the fabric of urbanization during the Early Middle Ages, and historians still debate whether they (or some of them) can be considered urban in origin, or acquired an urban character only after the political/military emergency that gave rise to them had been succeeded by more peaceful times. Yet certainly it can be argued that some were erected not just as a response to immediate needs for defence, but with a view to longer-term consolidation of re-conquest and re-establishment of law and order, including reviving and facilitating economic activity through local production of coinage and official oversight of sales of more valuable items, like livestock. The grounds for this interpretation are mostly the topographical layout of burhs, there being little documentary evidence. A notable, though isolated, exception is the burh constructed by the earl and lady of Mercia in the closing years of the ninth century at Worcester  already the location of a monastery and seat of a bishop, a local authority figure  to enhance protection for the existing inhabited area and provide refuge for residents of the surrounding countryside; they then granted the bishop half the revenues due them from the marketplace (ceapstowe) and streets, meaning property rents, a periodic levy for maintenance of defences, and profits from judicial administration of offences that occurred in the streets and marketplace [Walter Birch, ed. Cartularium Saxonicum, vol.2, p.222. ], although tolls on through-trade (probably mostly of salt) remained a royal perquisite. Clearly the market was an important feature of the site  market activity pre-dating the burh, but the marketplace, with road link to a river-crossing, being an integral, and possibly new, element of the planned layout  and market trading there was subject to enforceable regulations; Domesday evidence suggests the marketplace was surrounded by residential plots. However, it has been argued that layout of the site as an urban nucleus may have taken place at a later, more peaceful time than the erection of the defensive enclosure [differing interpretations are discussed by Jeremy Haslam, "Planning in Late Anglo-Saxon Worcester", pre-publication draft available online at https://jeremyhaslam.wordpress.com; last accessed 15 August 2018]. It has even been speculated that the burh system was developed along the concept of a network, placing garrisons within close range of many strategic or vulnerable points, assuring them supply depots, providing relatively easy access (a day's walk) for much of the population if refuge were needed, and perhaps even acting as a chain of signalling points to warn of danger [D.J.F. Stone, Mutually Assured Construction: Æthelflæd�s burhs, Landscapes of Defence and the Physical Legacy of the Unification of England, 899-1016, University of Exeter PhD thesis, 2017, p.39-41]. In some of the other urbanization strands commerce appears to have played a more central role, leading either to the establishment of new communities or the intensification of rural settlement into what has more of an urban appearance. It may be stretching the evidence to envisage a network of burhs as the product of a unified and coordinated long-term plan, rather than the outcome of a series of initiatives over the course of several regnal generations; even more so to characterize such planning as urbanization, for a number of burhs do not appear to have been urban (based on modern criteria) until later periods, while some never became so. A similar issue is seen in later urban history: to what extent towns came into being as the result of conscious and perhaps long-term, multi-phase planning  the acquisition of a licence for market or fair often being the first phase. The idea of urban growth as solely organic  that is, "where the layout has evolved as a result of the uncoordinated decisions of many people, whether over a long or short period"[Susan Reynolds, An Introduction to the History of English Medieval Towns, Oxford: Clarendon Press, 1977, p.54], albeit decisions influenced by the natural features of a site (e.g. watercourses, hills, escarpments) and the ways in which a site was subjected to administrative mechanisms  is one now largely discounted. Nor did towns  even one as carefully planned as New Winchelsea  come into existence, like Athena springing from the head of Zeus, fully formed, the rapid realization of some monolithic vision ; rather, they developed, over an extensive period of time, as an initial concept or plant underwent an almost ongoing process of reiteration: expansion, contraction, and even re-invention, adding that which became necessary and removing that which became redundant, in response to the changing requirements and behavioural patterns of stakeholders and users. In this sense, at least, towns might be thought of as organic. But we do better to think of urban growth in terms of a mix of multiple phases of planned and organic development; indeed, it has been claimed that "towns are the most artificial of all human creations" [Colin Platt, The English Medieval Town, London: Secker & Warburg, 1976, p.37]. As regards market towns, marketplaces and communities of tradespeople tended to appear close to buildings where local leaders were based  castles, parish churches or religious houses, manor-houses. On the other hand, urban neighbourhoods could be adjuncts to existing settlements and in some cases even suburban. In either case, the different components of a site were all, for a while at least, integral to the product. Thus we have to visualize the growth of towns as composites of different units, created at different points in their histories, the typical, though not universal, process beginning with non-urban components (e.g. village, fortress, monastery), acquiring a more specialized trading unit, then potentially expanding commensurate with economic growth through additional residential units which might in some cases include more specialized markets or industrial areas. In parts of Europe cities might grow around a bilateral core, distinguished as castrum, the old Roman or post-Roman fortified site serving as the acropolitan base for administrators and social elite, and borgo, a suburban add-on where merchants and artisans lived close to a marketplace. In England there was no such formal distinction made, yet the duality is sometimes perceptible, for the Normans imported a version of the European urban model, in which the castle served both administrative and residential functions. In fact, Beresford estimated that "80 of the towns planted between 1066 and 1100 were alongside castles, and more than half of those between 1101 and 1135 were similarly situated." [New Towns of the Middle Ages: Town Plantation in England, Wales and Gascony London: Lutterworth Press, 1967, p.334], this being the period when the Norman conquerors were trying to assure their hold over the country and the only precariously subjugated Anglo-Saxon population.